Fred Greene and his Custom Shop team introduced their CS series of limited edition Martin instruments in 2011. 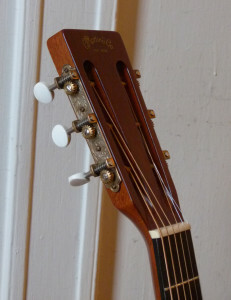 For 2012 they featured a special 12-fret guitar that yet again combines some of the best features of vintage Martins in combination with innovative features made possible by modern engineering. It has a comfortable, modern feel to the neck, but otherwise it is based upon a wonderful example of the first instruments to sport the name dreadnought. And it gets a thinner nitrocellulose finish, which simulates finishes on vintage guitars, after they have thinned out over decades of time. The CS-D18-12 has a marvelous voice that is effortlessly large yet clear, ringing, and simply a joy to hear. Once again Greene and his team have put together a unique instrument and gotten it right. In 1916, the Ditson department store requested that Martin make an instrument that could serve as a “bass guitar” for mandolin orchestras and Hawaiian music ensembles. Named for the largest class of British battleship ruling the waves at that time, the dreadnaught (sic) dwarfed the Martin 000, which was their largest body size. This new size was not offered under the Martin brand until 1931 (with the revised spelling of dreadnought.) The CS-D18-12 isn’t actually based on a D-18, but rather it closely resembles a particular 1929 Ditson model 111, which resides in the Martin Museum. As retro as many of its features may be, none of them holds a candle to the vintage cred of the sinker mahogany used for the back and sides, which is estimated to be 400 years old. Sinker wood gets its name from logs that sink as they are being transported by lumberjacks during logging runs. Such logs are sometimes recovered from bodies of water, and are then dried out before being utilized for various purposes. In recent years, Guitars have been made from sinker wood, as it provides an opportunity for luthiers to build with wood that simply no longer exists in the wild. The mahogany log that provided the back and sides for the CS-18-12 was recovered from a river in Belize, where it sat submerged for over 100 years. This is old growth mahogany from a tree believed to have started its life some 300 years before it was felled. Given the fact this log did not remain afloat implies it was denser than normal. And after being subjected to water pressure all those years, it is even denser. But you wouldn’t know it from the weight of this guitar; it is wonderfully light in the hand. 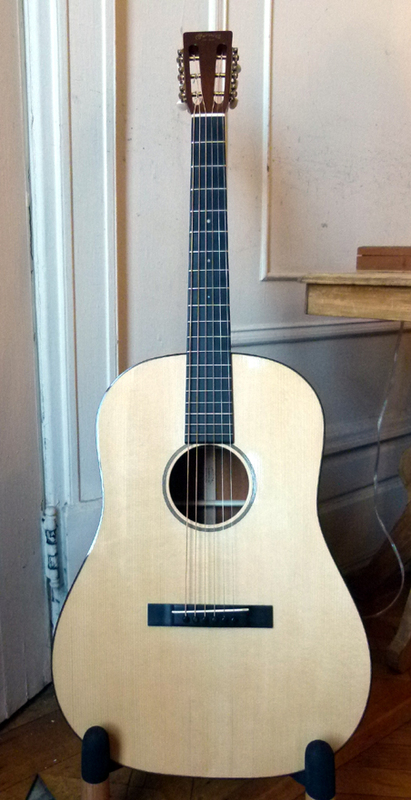 I was at the Martin factory on the day the CS model debuted and was able to do a direct comparison with the 1929 111. The modern guitar wasn’t as feather-light as the Ditson, and it did not sound as dried out in that mahogany hollow log sort of way. But it was still considerably lighter and more responsive to nuanced playing than most modern guitars. And it could be driven to a much more higher level of power and volume than the old timer, which could not be played with much vigor before it turned into a over-driven rattle. Martin has made other models inspired by the Ditson dreadnoughts, namely the modern version of the Ditson 111, as well as the 333, which is basically the same instrument but with some cosmetic differences, including a brown shaded top. These guitars were made with the construction and specs used on the Golden Era models, and in effect were the closest thing one could get to a standard 12-fret version of the D-18 GE. The CS-D18-12 has the same Adirondack spruce top and GE bracing as the Ditson reissues, but it has several key features that make it a bit more “authentic” when it comes to vintage vibe and vintage tone. Where the Ditson 111 and 333 have a modern, two-way adjustable truss rod in the neck, the CS-D18-12 has a non-adjustable T-bar. 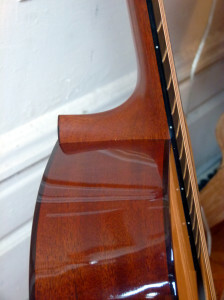 This lighter neck reinforcement is found in traditional Martins up past the 1970s. The Ditson models were made with modern, synthetic glue, but the CS-D18-12 was made with hot hide glue, just like all vintage Martins made before 1966. This feature would cost some $1,500 as an up-charge if someone requested it when ordering a one-off custom Martin. Hide glue requires a considerable amount of extra preparation and effort, but it has proven to affect the sound of a guitar in a positive direction. The Ditson models have the straight pyramid bridge used on vintage reissue 12-fretters, and the CS-D18-12 has a straight bridge without pyramids. 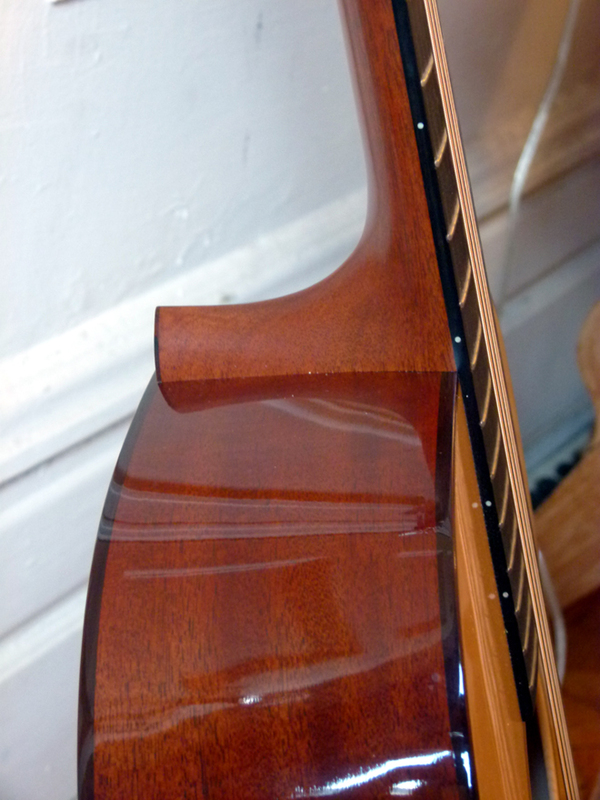 The plainer bridge is thinner at the wings, so it should have less of a dampening effect on the top, and it was used on many Martins in the 1920s and before. And the feature that really sets the CS guitar apart from the Ditson is the extra thin finish. This feature has now been used on the new Authentic series and some other limited editions. It is 40% thinner than typical Martin finishes of the modern era. It really does allow the tone wood to flex or “breath” more when vibrating with resonant energy. In a word, the guitar sounds lovely. With no effort at all it lights up with a wonderful purity that rings off every string, singing with a voice that is woody and chimey at the same time. And the density of the mahogany provides such a reflective effect that the slightest touch produces a great deal of tone. Subtle nuances in string tension or glides are easily heard, and ignite resonating sympathetics in the undertone and high harmonic overtones. It is a marvelous fingerstyle guitar, with that legendary string to string balance heard in 12-fret dreadnoughts, with a rich and round bass, strong, clear mids that stand out over a ever-present undertone, and angelic trebles that make me smile every time I hear them. But when under the guidance of a flatpick or fingerpicks, the CS-D18-12 is house-filling in terms of volume, while retaining the wonderful mahogany-Adirondack definition and chime. 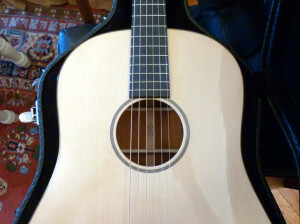 The one I played for this review never gets an opportunity to be driven full out, as the owner is a bare finger player of civilized fingerstyle music. I would love to hear one of these babies after it spent a couple of years with the likes of Norman Blake or Clay Hess. But as it is, it produces an enormous amount of tone, but the kind of open and expansive tone that makes mahogany such a well-loved tonewood. And one of the best things about this guitar is the fact it is a 12-fret mahogany dreadnought with the response and dynamics of a vintage Martin, but is so easy to play, thanks to its very un-vintage neck. All of the CS Series guitars offer a collection of specs that can be found on various Martins, but never before in the exact combination and configuration. For all its vintage features, the CS-D18-12 has a wonderfully modern feel to the neck. Up through the Woodstock era and beyond, all 12-fret dreadnoughts had a 1-7/8” neck, a mere 1/16” of an inch less than the fingerboard of a classical guitar, and they have string spacing of 2-3/8 at the saddle.” This CS model has a 1-3/4” width at nut and 2-5/16” spacing found on Martins like the 14-fret dreadnoughts in the GE/Marquis Series, as well as the recently retired OM-28V and OM-41 Special. But where all those models had a modified V neck, the CS-D18-12 has the CS neck profile, which has a lot less bulk and no V at all. Instead, it has a gentle curve that is somewhere between Martin’s low profile and modified low oval. And like the CS necks that appeared in 2011, the low carving lasts all the way up to 10th fret, where the neck heel is also slimmer than on typical Martins. On this particular CS model it is a bit meatier, in terms of how far the apex of the neck profile is from the fingerboard. But it doesn’t feel “deep” compared to similar guitars, because of that lack of V shaping. The neck is carved entirely by hand and extremely comfortable and very easy to handle. It is such a treat for the hands to be able to play a guitar so effortlessly that is such a feast for the ears. For all of its tonal opulence, the CS-D18-12 has tasteful and rather simple appointments that are as straight forward and refined as the voice ringing off the walls around it. The binding is made from Madagascar rosewood, which is also used for the simple back strip, end strip, and headstock face plate. It has the three dots on the fingerboard just like the early D-18s, but the rosette of three simple black rings and the wisp of purfling around the edge of the top are the same found on the vintage Ditson guitars, and are made from maple fiber. With the exception of the nut, saddle and bridge pins (all of which are fossilized mammoth ivory,) those abalone fingerboard dots, and the Waverly tuning machines, the overall aesthetic is based very much on the natural beauty of wood. And both the pristine Adirondack spruce and the shimmery banding of the sinker mahogany look every bit as inviting as the exquisite tone they make. 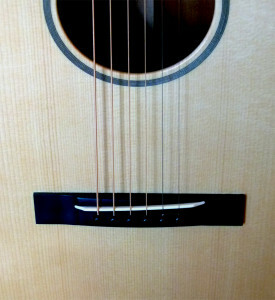 The standard dreadnought makes for a big guitar, but one that limits the fingerboard to only 12 frets. 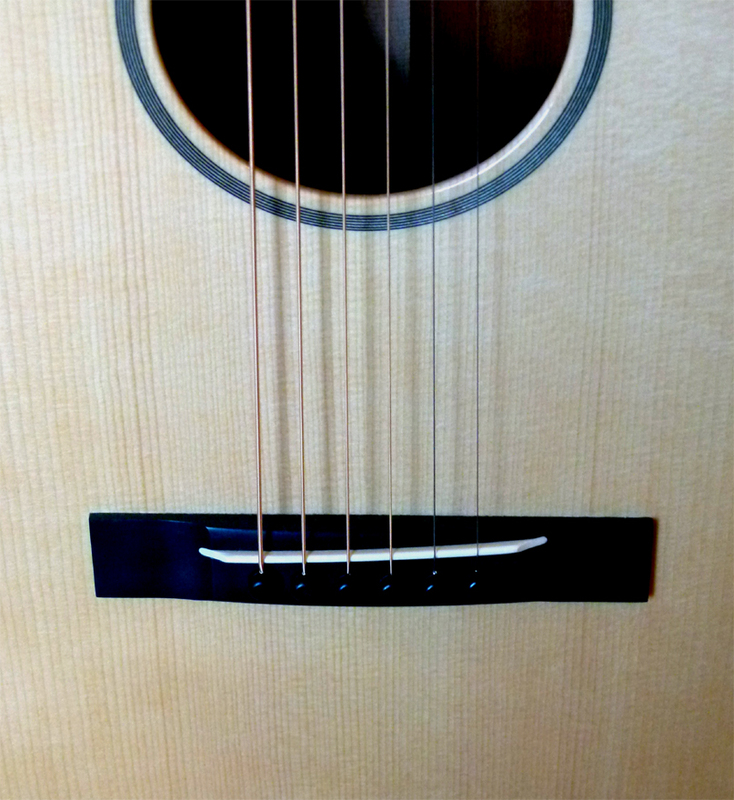 However the payoff is in reaped in tone, as nothing sounds quite as marvelous as a well-made 12-fret dread. The rounded shoulders increase the sound chamber, which enriches the voice. And the CS-D18-12 is right up there with the D-28 Authentic 1931 when it comes to sounding so good that I could see myself giving up a few frets for the chance to become immersed in such sonic splendor on an ongoing basis. But only the CS-D18-12 offers the vintage 12-fret dread experience with such a comfortable, modern neck. They only made 75 instruments in this limited edition, but you may still be able to find one, new or used, if you look hard enough. 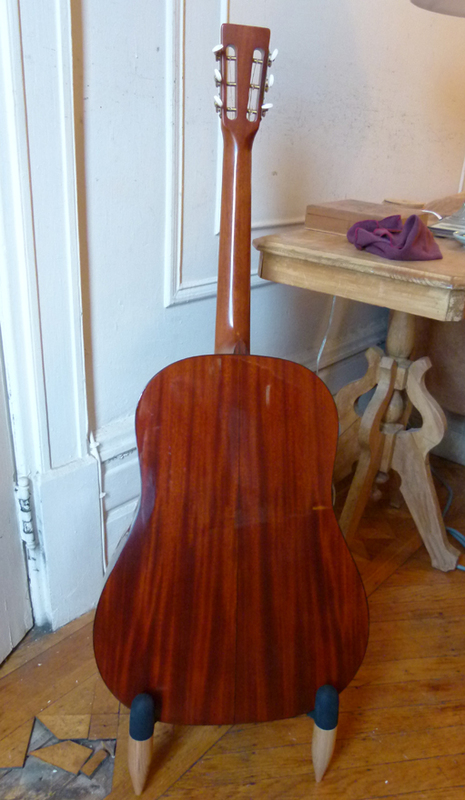 If you love great wood, great luthiery, and great mahogany tone you will likely find it is worth the treasure hunt. I don’t think that’s correct, as hide glue is a $1650 upcharge and not included in all CS guitars. All of the CS Series guitars designed by Fred Greene and Jeff Allen were made with hide glue, unless there is some exception I do not recall. I think hyde glue is way over rated. When I toured the Martin factory, a 30 year retired employee who was the guide, said if he had a custom guitar he would use the modern glues. I believe hyde glue is a $1500 premium! And I know several retired Martin employees who use hide glue exclusively repairing and refurbishing guitars because they feel it makes important differences. But that still does not mean it justifies the prices Martin charges for it. And, as mentioned above, that is one more reason why the CS models are considered a great value for the money, as they would cost considerably more if they were made exactly the same way as a private Custom Shop order. I just ordered a similar guitar, but did not specifically request hide glue. Will they use it anyway or should I have ordered it? I think I know the answer to this and I am bummed. ALL guitars made in the CS series to date are constructed entirely with hide glue. That is just one of the many aspects that make these guitars an exceptional deal.